We love cooking with orzo (and the kids love eating it), especially in this custardy baked pasta dish. It’s a great way to use up leftovers – think roast chicken and bacon, or keep it veg with mushrooms, spinach and cheese. 1. Preheat the oven to 190°C. Cook the orzo in boiling salted water until al dente. Drain and set aside. 2. Meanwhile, saute the mushrooms and onion or leek in a little olive oil until cooked, about 8 minutes. Add the baby spinach at the last minute until slightly wilted. Season with salt and pepper and add to the orzo. 3. Add the crumbled feta to the orzo mixture, taste and season again if needed. 4. In a bowl, whisk the eggs, yoghurt and milk together, season and stir into the orzo mixture. 5. Spoon the mixture into an oiled 20x12cm baking dish (square or round) and bake for about 40 minutes, until the top is lightly golden. Sprinkle with toasted pine nuts. Let stand for 10 minutes, then serve with a crisp salad. What’s your favourite pasta bake recipe? A great way to use up leftover pasta, this delicious vegetarian pasta bake makes an easy midweek dinner – you won’t even miss the meat! 1. Preheat oven to 180C. Cook penne in a large saucepan of salted boiling water, following packet directions, until al dente. 2. Meanwhile, heat 2 tbs oil in a large frying pan over high heat. Add mushrooms and garlic and cook, stirring often, for 4-5 minutes or until mushrooms are golden. Set aside. 3. Drain pasta and return to the saucepan. Add mushroom mixture, tomato pasta sauce, bocconcini and parsley. Season with salt and pepper. Stir well to combine. 4. Spoon penne mixture into a 10-cup capacity deep baking dish. Top with sliced tomato. Combine breadcrumbs, parmesan and remaining 1 tsp oil in a bowl. Sprinkle over penne. Bake for 15-20 minutes or until hot and breadcrumbs are golden. What’s your favourite vegetarian recipe? 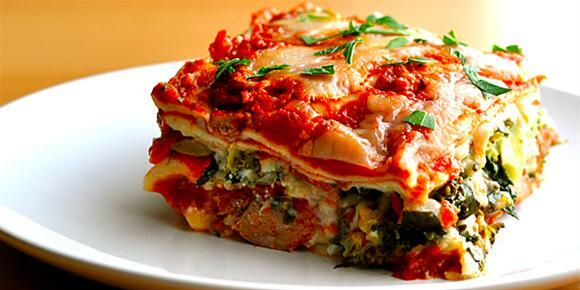 Craving a gooey lasagne – but turned off by the high fat and calorie count? This skinny lasagne is just as good as your favourite Italian deli, but without the guilt. The key is to bump up the vegetable count, and replace rich bechamel sauce with a low-fat ricotta and spinach layer. Serve with a big salad. 1. Preheat oven to 180C. Saute the onion and garlic in the olive oil over medium heat. Add the vegetables and saute until crisp-tender. Set aside. 2. Mix egg into ricotta cheese and stir in fresh spinach. Season with salt and pepper. 3. Pour a little passata in the bottom of a greased lasagne pan. Cover the base with lasagne sheets, then spread 1/2 cup ricotta mixture, ½ of the veggies, and ¾ cup sauce. Repeat and finish with mozzarella. 4. Cover with foil and bake for 40 minutes. Remove foil and bake for another 10 minutes or until cheese is golden. Serve with salad.